The "Golden Bull" of Hungary was ratified by Hungarian King Andrew II in 1222., a.d. and was indeed the first written Hungarian constitution where the term "hungarian nation" becomes a reality. 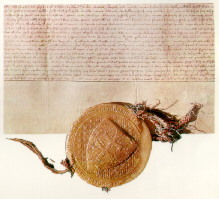 The document guaranteed rights to the servientes which had formerly only been enjoyed by the owners of great estates and also contained the famous "clause of resistance", whereby if the king failed to keep his word, the nobles were invested with the right to resist and oppose him without charge of disloyalty. The Golden Bull of 1222 for all purposes determined the principle of equality between nobles and occupied a central place in the thought of the Hungarian aristocracy for centuries. Although subsequently repealed, the clause of resistance initiated the long-term practice of throwing open the acts of the king to question. Because of the seminal role it played in the development of national constitutionality, the Golden Bull has frequently been likened to the Magna Charta of 1215, underscoring certain clear parallels in the constitutional development of Hungary and England. Andrew II was too weak to enforce the laws of the Golden Bull. An absentee king could not defend the interests of his servientes vis-a-vis the large landowners, who, consequently, responded by electing their own magistrates. 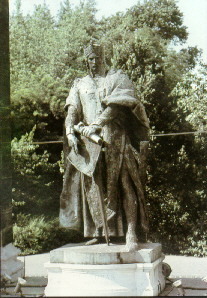 In 1232, the king legitimized this practice by granting, for the first time, the right to the servientes of Zala County to select their own magistrate. This initiated the historical process whereby the system of royally administered counties was gradually replaced with those which came under the jurisdiction of nobles. The fact that nobles were allowed to exercise autonomy within their counties was a central feature of Hungarian administration up to the mid-19th century.